This afternoon, J. hung some pictures for me. It's amazing how happy this makes me. For a while now, I've been dreaming of a wall of handprint themed art. On Pinterest, I've created a whole board of seasonal project ideas that involve the kids hands or feet made to look like other things. I imagine changing them out with the holidays or season, all in coordinating frames. It hasn't quite happened yet. But...today, we made a step toward the goal with a few framed pictures of the kids downstairs, and this little vignette in the family room. 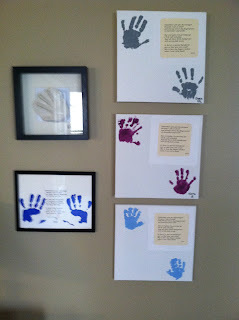 This is not a good photo, but along the right are prints with each of the kids' hands. On the left, handprints from J. and I when we were around kindergarten age. Mine is plaster of paris, so I popped it into a shadow box. J. 's inspired the other ones -- it features the same little poem I put with the ones for the kids. Grateful today to have a step towards a house that looks a little more pulled together. 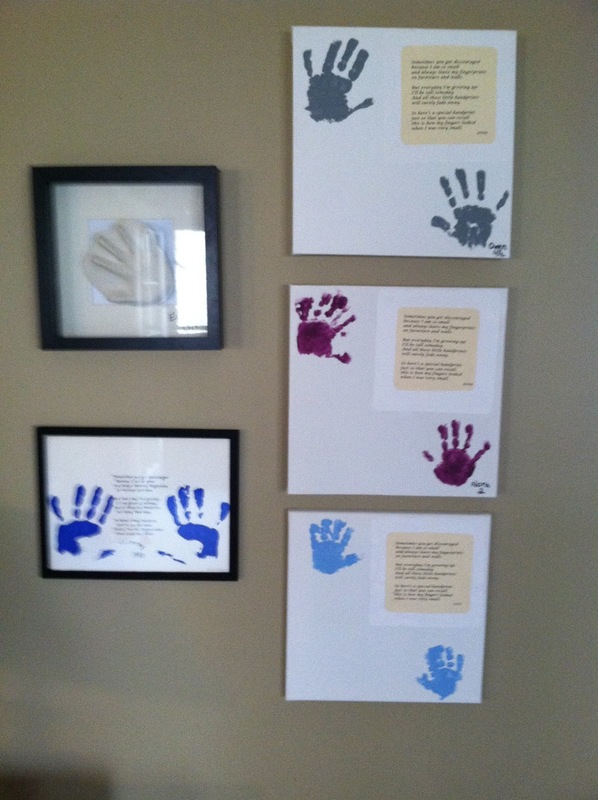 We did those same handprints with that poem when I was little. Wonder if my mom has them somewhere ... they're definitely not framed and arranged as artfully as yours! Somewhere, I have a hand print when I was a little one. I should really get mine out and hang it with ones from my kids. This is really an awesome idea. Of course, it will probably get done somewhere next to never - right along with all my other decorating plans (most pinned up on Pinterest, too haha). I think your idea of changing the artwork out with the seasons is also a GREAT one!